Forty percent of adult internet users have personally experienced some kind of online harassment, most of it involving things like name-calling or attempts to embarrass someone. But there are also more menacing forms of harassment, such as physical threats. That was the focus of a decision today by the U.S. Supreme Court, which overturned the conviction of a man who had made violent threats on Facebook against his estranged wife. The case involved a Pennsylvania man who had written posts on the social media site saying that he wanted to slit the throat of his estranged wife. The argument pitted prosecutors against free-speech advocates over whether the man’s posts constituted a “true threat” or whether it was “protected speech” under the First Amendment. In the closely watched case, the court ruled that it was not enough — as prosecutors had argued — to convict someone on the basis that the language used could be regarded as a threat by a reasonable person. The justices said there had to be proof that the writer actually intended the words to be a threat to warrant criminal charges. The case mirrors similar issues being wrestled with in the online world. Our 2014 study of online harassment noted, “At a basic level, there is no clear legal definition of what constitutes ‘online harassment.’ Traditional notions of libel, slander and threatening speech are sometimes hard to apply to the online environment.” However, today’s court decision rested on narrow legal grounds rather than First Amendment issues and did not suggest guidelines for the future. 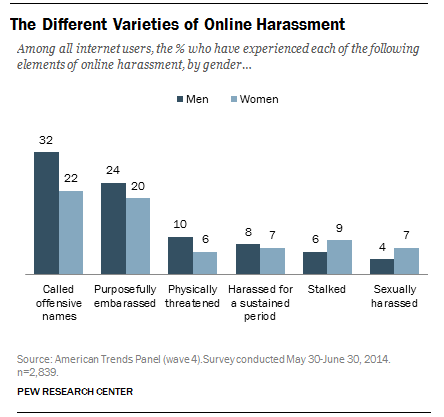 The two most common forms of online harassment for both men and women are being called offensive names or being personally embarrassed, according to the 2014 survey. The more serious forms of harassment are less frequent: 10% of men and 6% of women said they had been physically threatened on online platforms and similar shares said they had been harassed for a sustained period of time, stalked or sexually harassed. Another Pew Research Center study showed there are clearly times when social media activity does spill into the real world with harmful consequences, including physical fights, family feuds and disputes that caused them trouble at work. Young women (ages 18 to 24) are particularly vulnerable to some of the more serious forms of online harassment, according to our 2014 survey. They are significantly more likely to say they have been stalked or sexually harassed than men, although roughly equal shares of both young men and women say they have been physically threatened or were victims of sustained harassment. 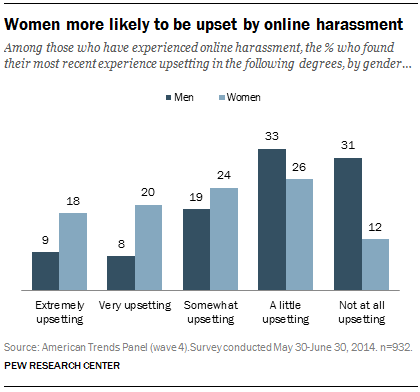 Women are also more likely than men to see online harassment as traumatic. Nearly four-in-ten (38%) women who experienced it found it extremely or very upsetting compared with 17% of men. The survey also probed internet users on incidents of harassment that they witnessed online: About a quarter (24%) said they had seen someone being physically threatened, 19% reported seeing sexual harassment and 18% saw incidents of stalking. Another quarter said they had witnessed someone being harassed for sustained periods of time online. Note: This is an update of a post originally published Dec. 1, 2014.